If food on its own is good, then food within other foods, foodception, must be even better, right? Whether you're looking to show everyone up at the next holiday party you go to or you're just looking for a way to get more flavors in your meal, these foods stuffed with other foods are sure to satisfy. Recently, Justin Timberlake proved that anything can be cool if Justin Timberlake's does it. For example, putting a blueberry in a raspberry can be an awesome new berry hybrid called the "Braspberry." This apple pie baked inside an apple is definitely the most apple-y apple pie you'll ever have. You can check out the recipe here. 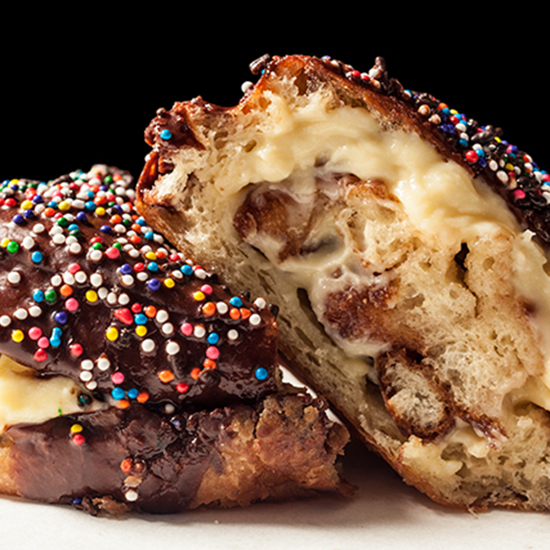 Another apple-y option: these custard-filled chocolate donuts stuffed with apple fritters are super extra. What makes chicken nuggets even better? A pretzel crust. What makes pretzel-crusted chicken nuggets even better? Stuffing them with gooey beer cheese. If bacon cheeseburgers are a little too moderate for you, try stuffing the burger with mac n' cheese. Plus, it cuts out the need for a separate side dish (though, you know, if you want to have fries on the side, we won't blame you). These grilled cheese bites take the classic grilled cheese and tomato soup combination and wrap them all up in one. If you want your romantic gesture to be extra super romantic, try making this conversation heart cake stuffed with (what else but) conversation hearts. Check out the recipe here. If a Reese's cup is a cup of chocolate stuffed with peanut butter, then a Reese's cup chocolate cupcake is a chocolate cupcake stuffed with a cup of chocolate stuffed with peanut butter. Cinnabon's cinnamon roll-stuffed chocolate chip cookies were all kinds of dessert-y deliciousness all in one. Speaking of chocolate peanut butter, peanut butter brownies are even better when they have Oreos in them. For something more meal than dessert, try these meatballs stuffed with French onion soup. How can we talk about foods inside other foods without bringing up the over-the-top Thanksgiving classic, the Turducken—chicken stuffed in a duck stuffed in a turkey? Or the dessert counterpart, the Piecaken, where you bake the three classic Thanksgiving pies—pumpkin, pecan, and apple—into a tower of cake. This article was written by Clara Olshansky from Food & Wine and was legally licensed through the NewsCred publisher network. Please direct all licensing questions to legal@newscred.com.